A classic family recipe handed down through the generations. These homemade yeast bread rolls are light, fluffy and golden brown. A tasty addition to any meal on your table. Slather them with butter and they will melt in your mouth. Could there be anything better than a home that’s filled with the aroma of freshly baked bread? 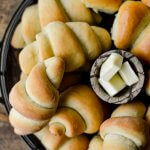 There’s no way to avoid the temptation of hot buttery crescent rolls straight out of the oven. It has been the demise of many a person on a diet over the years. But what a way to indulge. 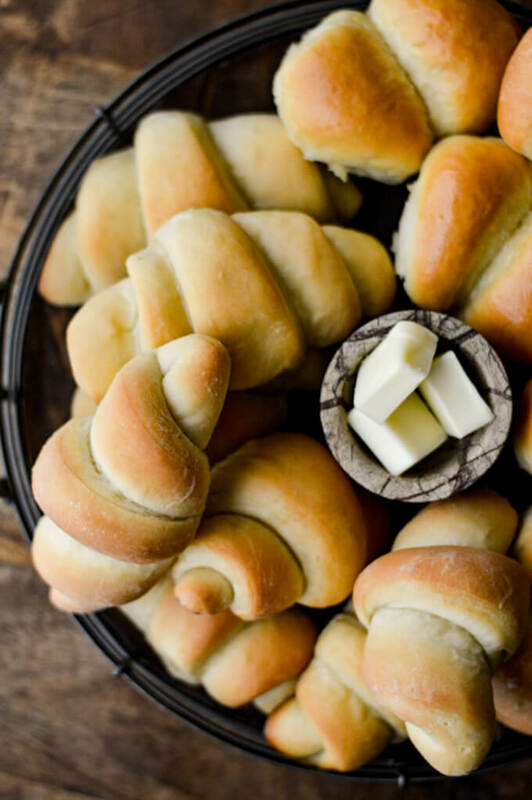 Once you bite into one of these yeasty, buttery rolls, you will not be able to avoid another bite, then another one, and so it goes. I’ve been making these for years and they have never failed me. This has been in my family and handed down to me from my mom, who received it from my grandmother and so on for generations. I’ve perfected the art of breadmaking over the years, but from the first time I made it as a young woman, I was amazed at the results and knew this recipe would be with me for life. The recipe is easy to follow. 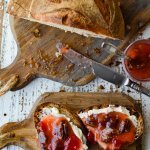 Even though it takes some time for the kneading and rising of the dough, this bread is quite easy to make. The step-by-step instructions are simple and straightforward. All you need to know is what ingredients to add together and when to add them, how long to knead and the rising times. 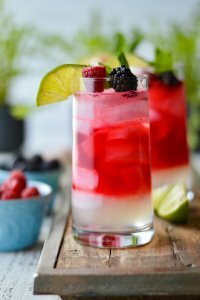 The list of ingredients is short and you probably have everything on hand. Open your cabinet and I’m pretty sure there will be everything you need: shortening, flour, sugar, salt, and eggs. The only thing you might have to pick up at the grocery store is some packets of yeast. There’s a variety of ways to be creative with shaping your bread rolls: I chose crescent shapes for this post, but there are so many ways to show off your bread: cloverleaf, knots, twist, butterfly, only to name a few. 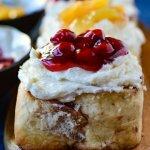 If you’re interested in checking out some other ideas to shape your rolls, click here for tipnut.com. 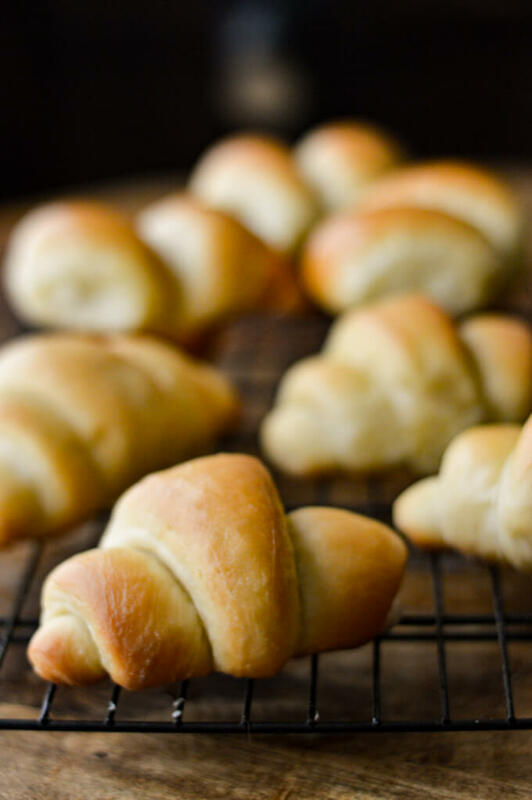 These Homemade Crescent Rolls can be made ahead of time and frozen. They freeze like a dream and when ready to serve, you pull them out, thaw, and pop ‘em in the microwave for a few seconds. They literally taste just like you pulled them from the oven. 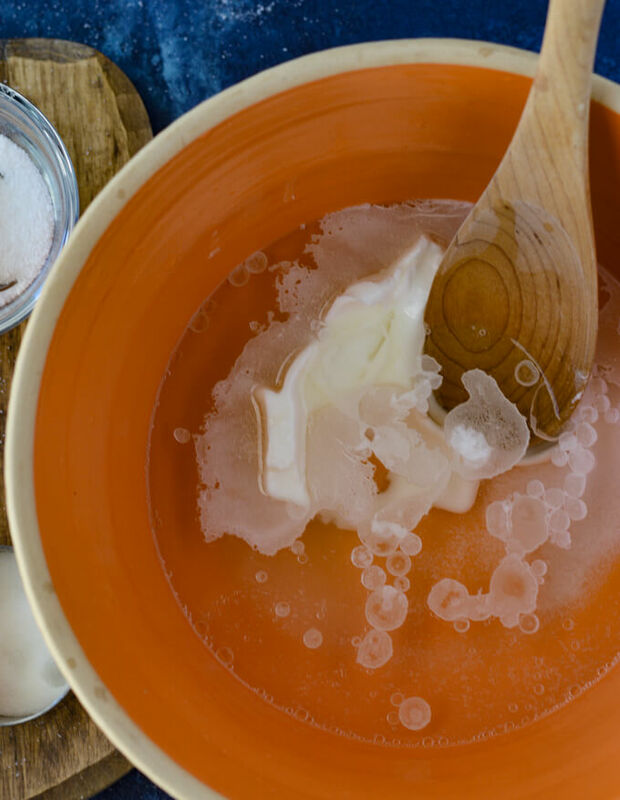 Step #1 – Melt shortening and dissolve sugar and salt in boiling water. Add shortening, sugar, and salt to a large mixing bowl. Pour boiling water over those ingredients and stir until the shortening melts and the sugar and salt dissolve. 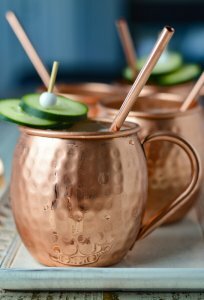 Set aside until this mixture cools to room temperature. 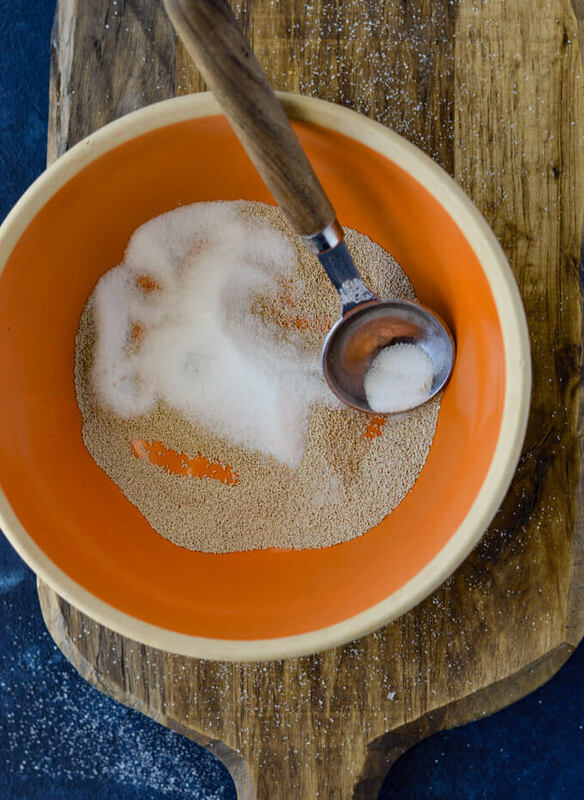 Step #2 – Combine sugar and yeast with warm-to-the-touch water (105-115°F). While the shortening mixture is cooling to room temperature, combine the sugar and yeast. Sugar is food for yeast and helps it to rise. Add warm water and stir until the yeast is dissolved. You want the water to be extra warm to the touch, but not hot. You may want to use an instant-read thermometer to begin with to get the right feel of it. The thermometer should register between 105-115°F for the perfect temperature. Any higher than that will kill the yeast. 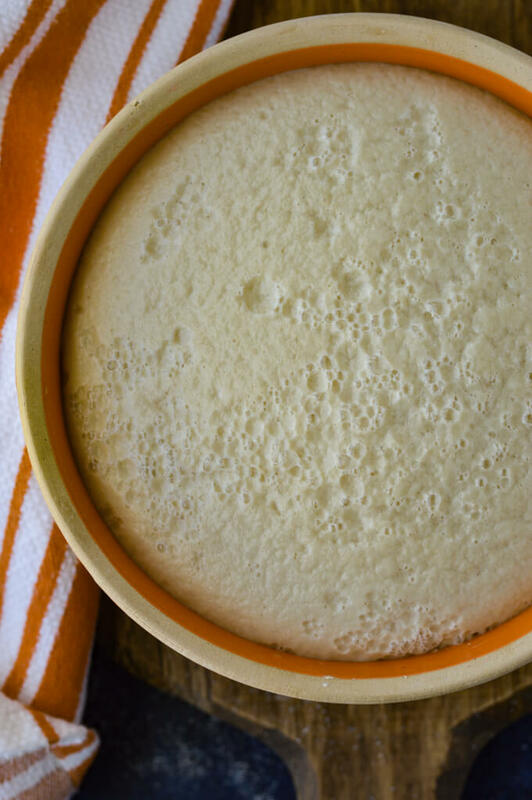 Step #3 – Let the yeast mixture sit for about 10-15 minutes or until the foam on top doubles in size. If the yeast does not rise, it’s because the water was too hot or the yeast is old. If that’s the case, you will need to start over. This is an indication that your bread will not rise well either. 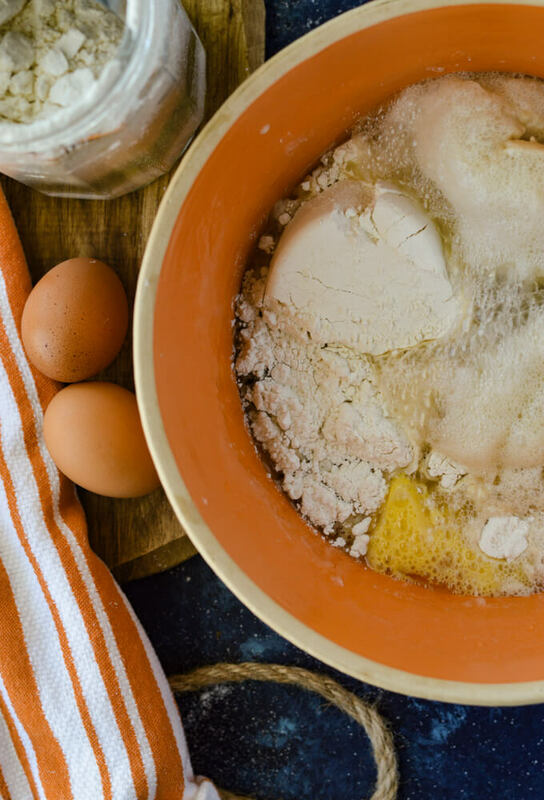 Step #4 – Combine the shortening mixture, the yeast mixture and beaten eggs together. Start with 5 cups of flour. Mix the shortening mixture, the yeast mixture, and the eggs together with a wooden spoon. Then start with 5 cups of flour and use the wooden spoon to mix it into the liquids. You’ll notice the dough is still very sticky at this point. Using your hands to mix now, continued adding flour one cup at a time until it is somewhat firm but still a little sticky. Step #5 – Knead the dough for 8-10 minutes. Sprinkle one cup of flour onto a large cutting board and dump the dough onto the flour. Knead the dough for 8-10 minutes. How to knead: With the heels of your hands, push the dough down and flatten out the dough while pushing it away from you. Give the dough a quarter turn, fold over half of the dough and continue to push down and away. When you notice the dough becoming sticky again, sprinkle more flour onto the surface and continue with this process. When the kneading is completed the dough will be smooth, will bounce back when pressed with your fingers and will no longer be sticky. Step #6 – After kneading add dough to a large mixing bowl to rise. 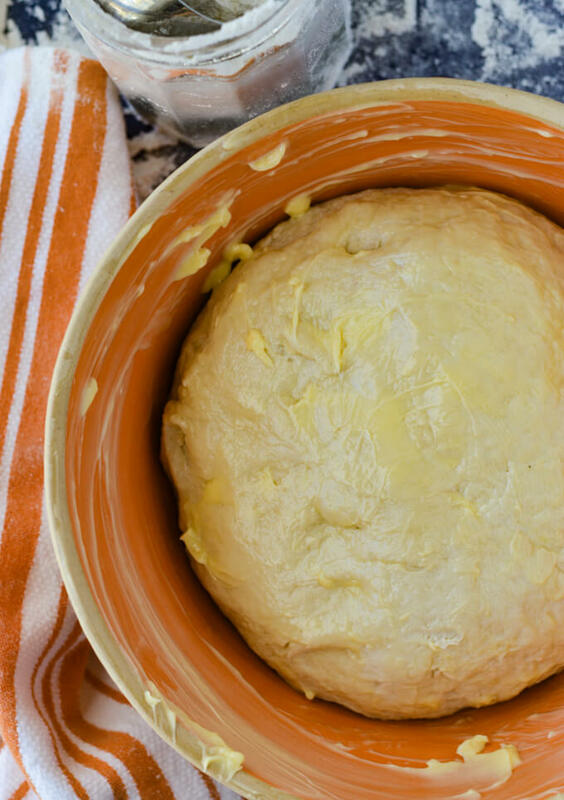 Smear the bowl with butter and lay the kneaded bread dough into the bowl. 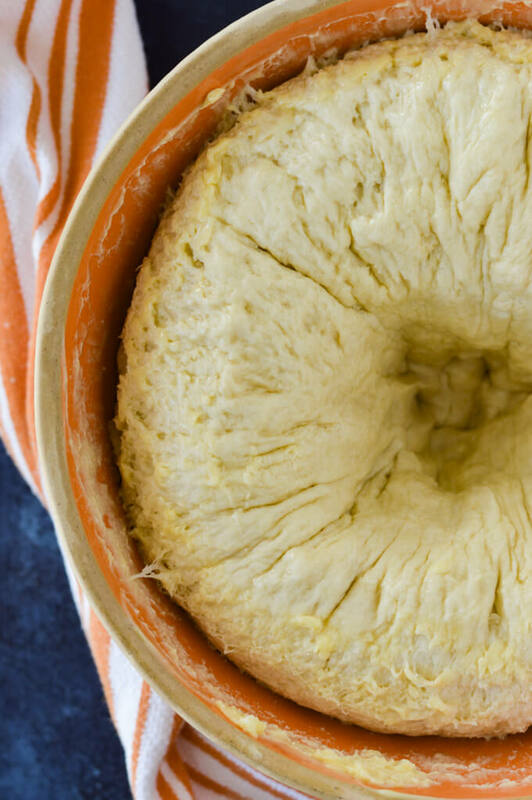 Smear the dough with butter and cover with a dish towel. 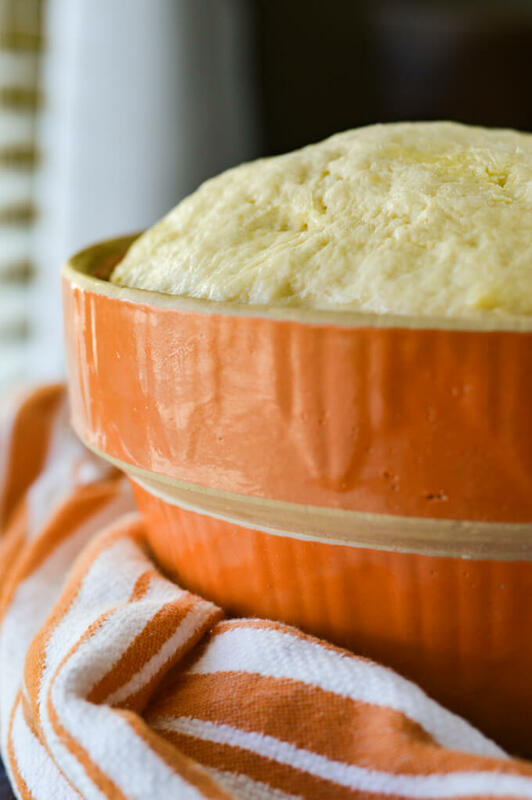 #7 Step – Let the dough rise for one hour. Place the dough in a warm place and let it rise for one hour. You’ll notice the dough has doubled in size. Step #8 – Punch down the dough. Once the dough has doubled in size, punch down the dough with your fist. Step #9 – Separate dough into two equal balls. 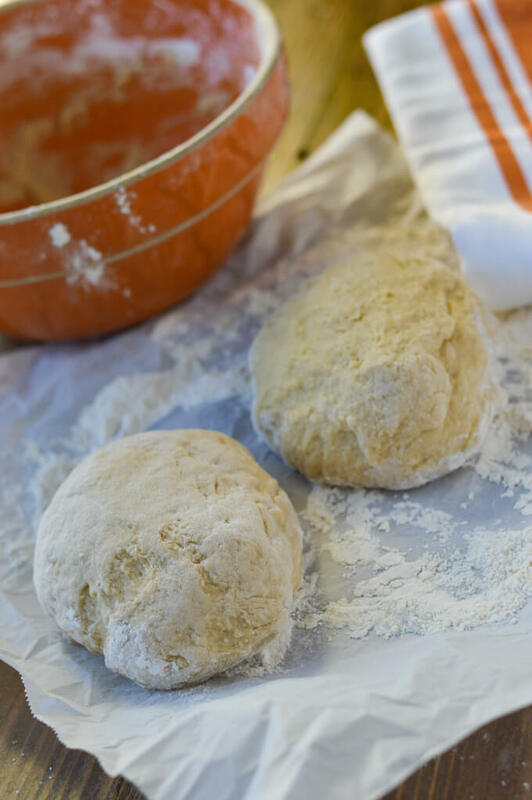 Step #10 – roll out each dough ball to about 17-inches in diameter. Roll out each ball separately to a 17-inch diameter circle. Using a pizza cutter, cut the circle like a pizza into 12 triangular wedges to give you 24 crescent rolls altogether. Roll up each wedge from the wide rounded edge into a crescent shape. Tuck the pointed side of the section under the roll. Step #11 – Place each crescent roll onto an un-greased cookie sheet. Place the crescent rolls unto a cookie sheet and place in a preheated 375°F oven. Bake for 20-25 minutes or until the rolls are a golden brown. Remove them from the oven and brush with melted butter. 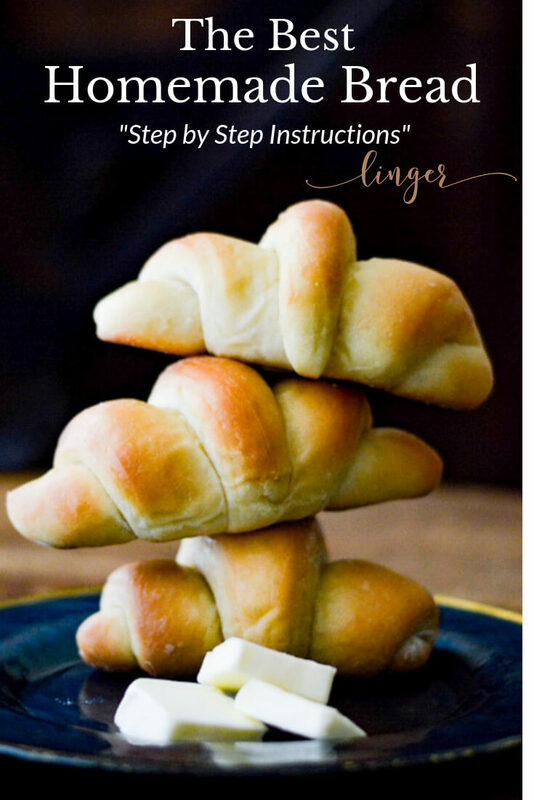 Step #12 – Let Crescent Rolls cool on a wire rack. One family recipe that has been around my house for as long as I can remember are these “Homemade Bread Rolls.” If you’re gonna indulge, indulge with butter slathered all over them. 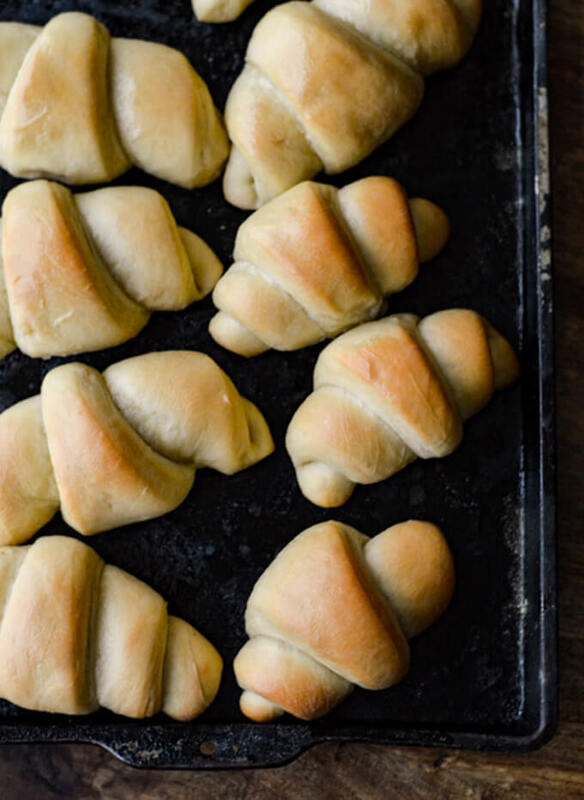 These Homemade Crescent Rolls serve as the ultimate comfort food, a wonderful holiday table addition, and of course, sneaking a midnight snack. A bonus to top off these buttery delights is my Homemade Peach Preserves. 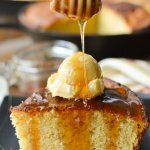 This bread recipe is the one that I use for my Homemade Cinnamon Rolls which are a melt-in-your-mouth food luxury you must have. 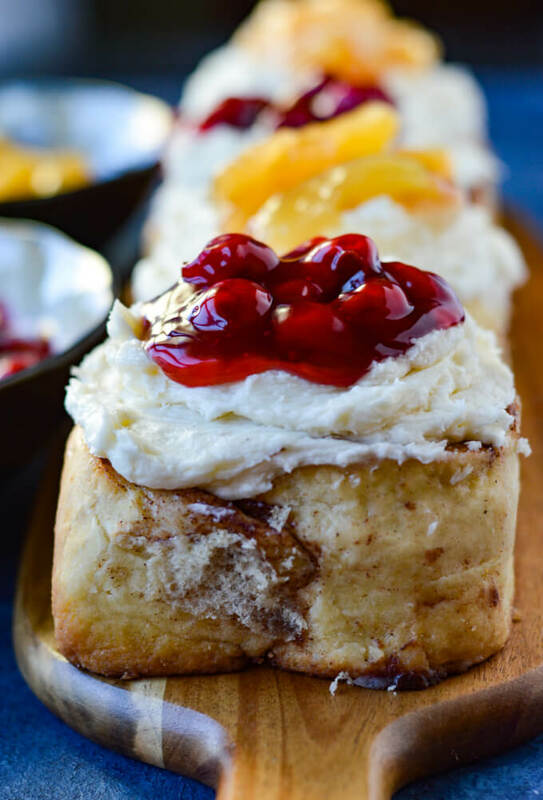 Click here or on the photo below to grab that Cinnamon Roll recipe. You’re gonna love them, I promise! 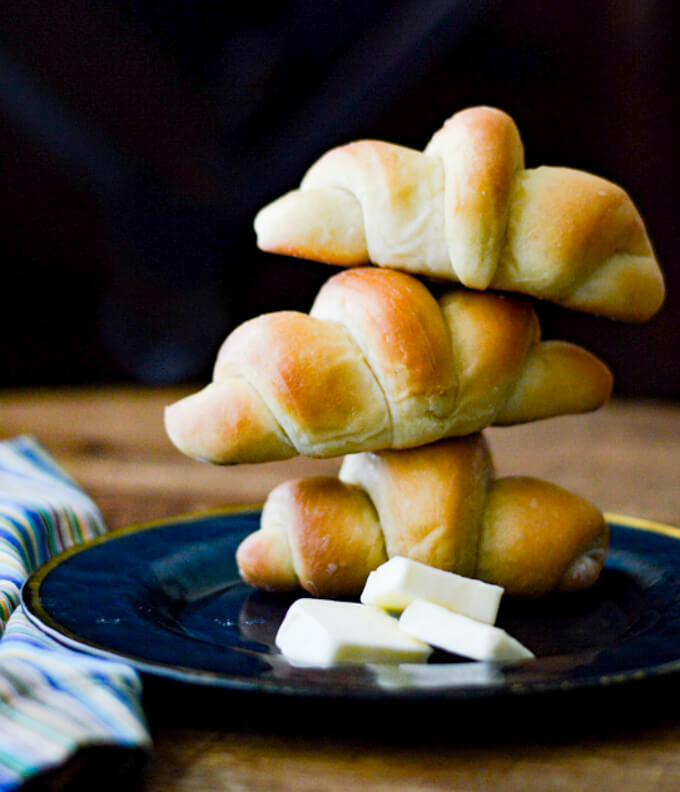 These homemade yeast bread rolls are light, fluffy and golden brown. Here is a classic family recipe handed down through the generations and a tasty addition to any meal on your table. Slather them with butter and they will melt in your mouth. In a large bowl, combine sugar, shortening, salt, and boiling water. Stir until dissolved. Set aside and let cool to room temperature. In a small bowl, combine yeast, 1 tablespoon sugar, and 1 cup luke-warm water (105-115°F). Stir until dissolved. Set in a warm place (a microwave works great) for 10-15 minutes until the yeast has risen and the foam is doubled in size. Add the beaten eggs and yeast mixture into the melted shortening mixture. Make sure the shortening mixture has cooled to room temperature. Stir in 5 cups of flour. Continue to add the remaining flour one cup at a time. At this point, I use my hands to fully combine the ingredients. The texture of the dough should be somewhat sticky but firm enough to work with. Place the dough on a floured surface and knead for 8-10 minutes. Continue adding flour to the surface as necessary when the dough becomes sticky again. Continue kneading until the dough is smooth, bounces back when pressed with your fingers and is no longer sticky. Butter a large mixing bowl along with the ball of dough using the 2 tablespoons of butter. Cover with a dish towel and place in a warm area. A microwave works great or on top of a warm stove. Let rise for 1 hour. Punch down the dough and divide it into two large balls. Roll out each ball to a large circle about 17-inches in diameter. Using a pizza cutter, cut the circle like a pizza, making 12 triangular wedges with each circle. Roll each triangular wedge starting from the wide round end. Tuck the pointed end under the roll. Place the crescent rolls unto an un-greased cookie sheet with 2 inches between each roll. Cover with a dish towel and set in a warm place. Let rise for one more hour until the rolls have doubled in size. While the rolls are rising, preheat the oven to 375° F.
Bake the rolls until golden brown, approximately 20-25 minutes or until golden brown. Brush melted butter on the rolls as soon as they come out of the oven. Make sure and let the melted shortening, dissolved sugar and salt mixture come to room temperature. If it is too hot it can kill the yeast. Using sugar with the dry yeast helps it to rise. Do not use water for the yeast that is beyond 115°F as this will kill the yeast as well. Start 5 cups of flour using a wooden spoon to stir. Then continue adding flour one cup at a time and mixing with your hands. Adding too much flour will make the bread heavy and dense. It should be somewhat firm but still sticky before starting to knead. 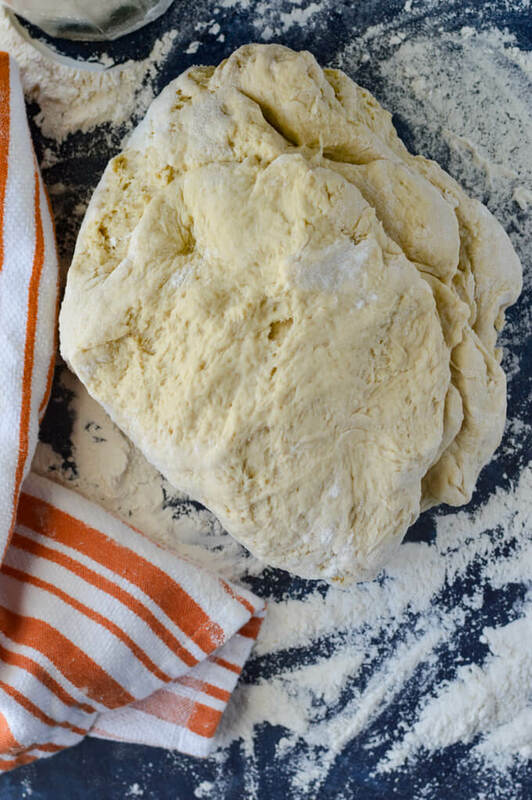 How to knead: With the heels of your hands, push the dough down and flatten it out away from you. Fold half of the dough and continue to push down and away, over and over for 8-10 minutes. Continue to sprinkle flour to the surface as the dough becomes sticky again during the kneading process. The dough needs to rise 2 separate times. The first time in a large mixing bowl. Smear both the bowl and the dough with butter. The second time after you have made the crescent rolls. On both instances, cover with a dish towel and set them in a warm place (like a microwave). Let the dough rise again for 1 hour until doubled in size. 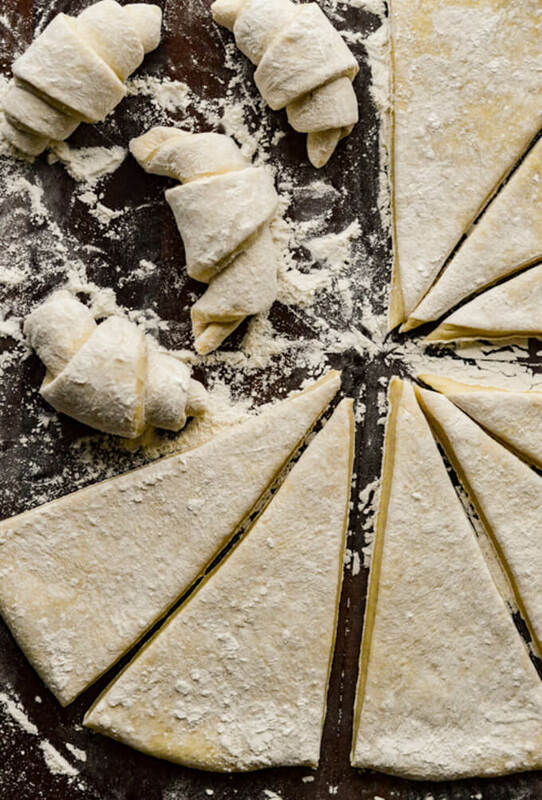 For crescent rolls, roll each ball of dough out to a 17-inch diameter and cut into 12 triangular sections. A pizza cutter works great for this. Immediately brush melted butter on the rolls as soon as they come out of the oven. These rolls can be made ahead of time, baked and frozen. When ready to serve, you pull them out, thaw, and pop ‘em in the microwave for a few seconds. These rolls looks fantastic. 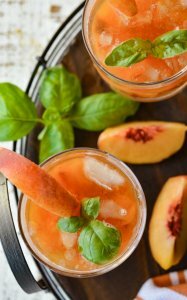 They are making my mouth water as I read the recipe. Thanks for posting. actual effort to generate a good article? but what can I say? Thanks so much for coming to my site and for your comments. Thanks so much for stopping by Latesha! I hope you find the recipes to be of great value to you. Let me know if you try any. I would love to hear what you think.